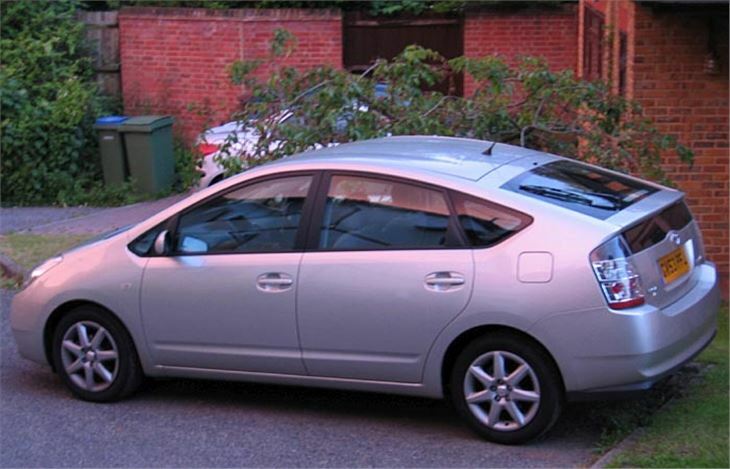 We’d been together for six months now and, though I’ve been unfaithful with scores of other cars in that time, I was still happiest with ‘my’ Toyota Prius II. Now she’s gone I feel even more of a gap in my life than when I sold my much loved SEAT Leon 20VT. What at first appeared strange, almost alien, about the controls and they way the Prius needs to be driven now seem so obvious I wonder why other cars aren’t the same. You plip your way in, push the electronic key into its slot, press the start button, kick off the foot operated parking brake, shift your left foot to the brake pedal, then snick the tiny gear selector lever from ‘P’ on the display to ‘D’ or ‘R’, lift off the brake, press the accelerator, and off you go, silently, on the electric motor. Which is perfect for the neighbours when I have to set off at 5.00am. 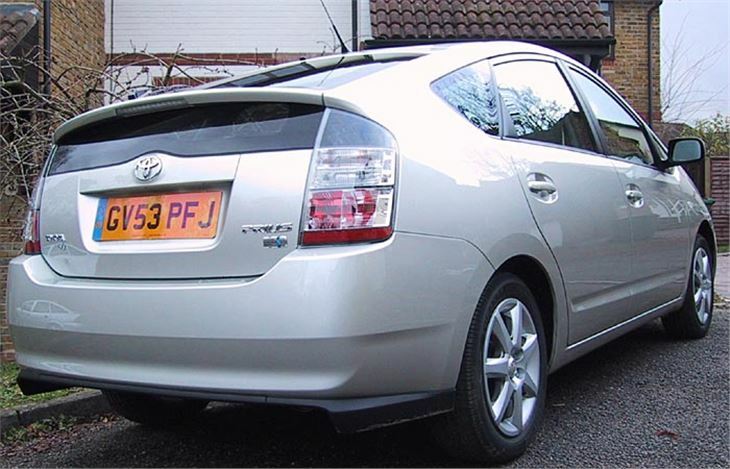 Usually the engine purrs into life soon after, but even this can be prevented by pressing the EV button and motoring out of anyone’s earshot electrically. It’s delightfully simple. 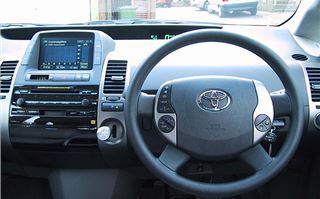 Get stuck in traffic or have to stop at a road junction or lights and, once stationary, you press a button marked ‘P’ to lock the transmission and can take your foot of the brakes. Touch the brakes, snick the lever to ‘D’ and you’re in ‘Drive’ again. How the whole thing works is there’s a big electric motor between the engine and the transmission, a bit like the ‘Dynastart’ on Isetta bubble cars. 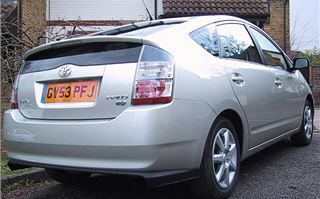 This serves as generator in some drive conditions and when decelerating or descending a hill, and can also employ the charge it has built up in the batteries between the rear wheels to either power the car entirely at low speeds or provide added power to the petrol engine. On a very steep descent, you snick the little lever into ‘B’ to provide engine or electric motor braking. Honda does something similar in its Insight and Civic IMA. Citroen has done it too with a version of the Berlingo van. 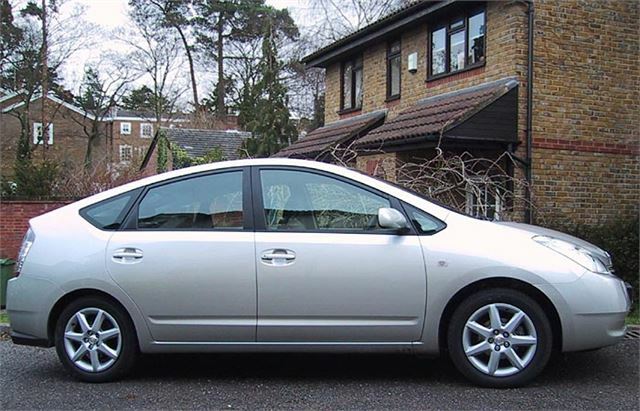 But Toyota takes this a couple of stages further by using an Atkinson Cycle version of its chain-cam variable valve timed 1.5 petrol engine and an epicyclic ‘continuously variable’ automatic transmission. I confess, I don’t understand much of this, but apparently an Atkinson cycle engine mated to a conventional gearbox would be almost undrivable because it does not accelerate smoothly. It runs at a series of fixed revs at which it is most efficient. Mating it to a continuously variable transmission masks this, and the overall effect of petrol engine, electric motor assistance and CVT box is not hugely different from any other CVT automatic. Exactly what happens when is shown on a pictogram on the central screen of the dashboard, if you want to watch it. 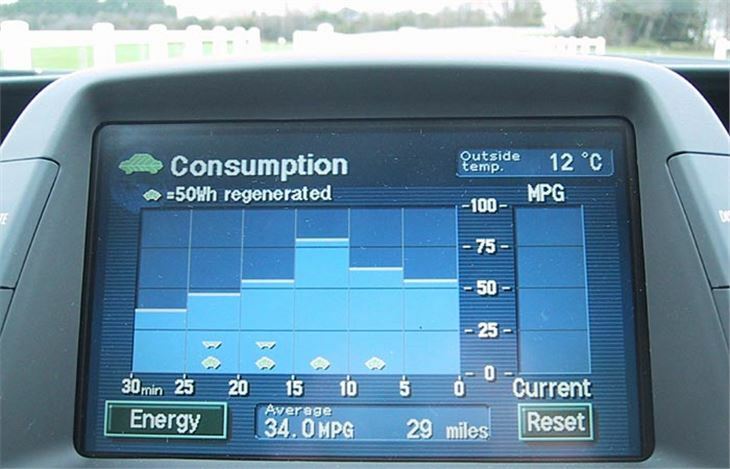 An alternative display shows the amount of energy regenerated and stored. 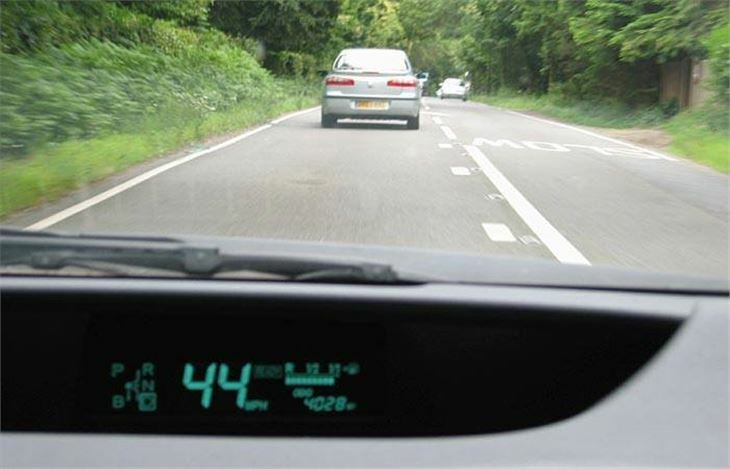 Once you have driven a bit, enjoying the car’s brilliant speed display right in your line of sight at the base of the windscreen, you build up energy in the batteries which the car’s systems will then use at appropriate moments, or you can press the button marked ‘EV’ and it will run solely on electricity until the stored energy runs out. The process is at its best in moving traffic that alternately slows speeds up and slows down, as in the current M25 contraflows near Heathrow. The slowing down allows regeneration of energy, which the systems then use to save fuel. Alternatively, if the contraflow is moving steadily and you have already driven some distance that day to store up some energy, you can set the cruise control to 40mph, press the EV button, and watch your average mpg rise considerably. Driving regeneratively for my first 1,000 miles or so, I managed over 58mpg. Unfortunately you don’t do so well when you have to travel long distance on the motorway and time is of the essence. Then you experience very little regeneration so the consumption you get is effectively that of an efficient 1.5 litre engine driving a 1,300kg car with an extremely low Cd of 0.26. I tend to manage 40 – 45mpg on the motorway and 49mpg overall. 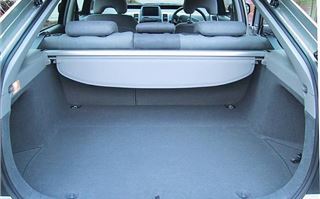 Having run the car for 6 months I have used it for all sorts of things, including furnishing a house. 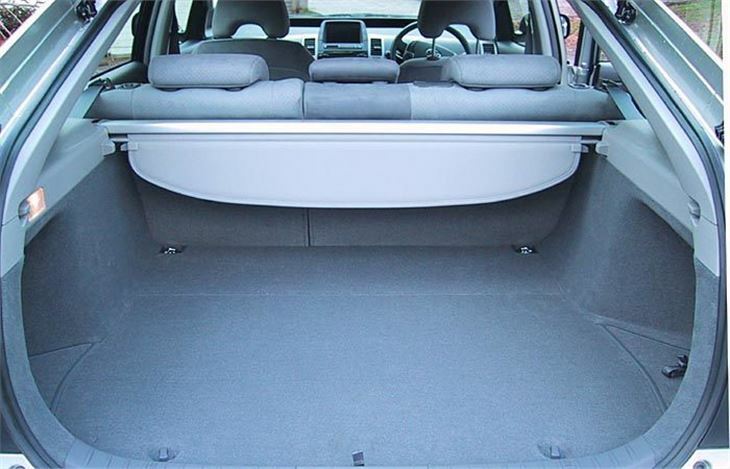 Though the load bay is high and shallow to clear the batteries between the rear wheels, the rear seats flop down painlessly at the press of two buttons and leave enough space to squeeze in a double mattress, TV set, CKD sofa-bed; basically everything I needed without having to resort to the bigger family Mondeo. It also handles very well, though you have to be careful with the throttle to set it up so you don’t get a gear-change half way round the bend. Left foot brake into the corner to get the back out slightly and you will find you can safely carry a lot of speed through without any screeching or drama of any kind. A word of praise for the computer-controlled powered brakes, which can be noisy at low speeds but have such sensational stopping power they almost justify a warning notice on the tailgate. Further applause for the ‘P’ button, which locks the transmission in Park if you are stopped at traffic lights. To move off again you simply dab the brake and move the lever into ‘D’. It works so well there is absolutely no excuse at all for blinding the driver behind with your stoplights by sitting on the brakes. Finally, the steering wheel. Buttons on it control the stereo, the aircon, air recirculation and demisting, so no need to take your eyes off the road and that superb speedo display. 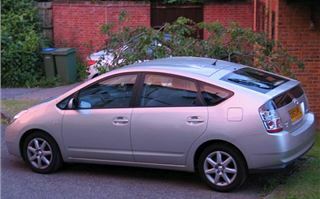 And last but not least, anyone worried about the crash safety of this hybrid shouldn’t be. It scored the full 5 NCAP stars for occupant safety and a creditable 2 stars for pedestrian safety. But she’s gone into the sunset. Whoever gets her please take as good care of her as you will of the environment.